From hot to cold: What have I missed? This time last week I was sipping an ice-cold beer by the pool under the American sun. Now though, as I place my laptop in front of the fan heater and sip a steaming coffee, I forget about my holiday and concentrate on the Swans. It’s been a while since the last blog, so let’s make up for it! Before I give my thoughts on last night’s shocker against Portsmouth I ask myself: What did I miss while I was away? Well, technically, I didn’t actually miss anything. As this is the age of WIFI, iPhones and Twitter, most of the Swans news was easily accessible but, for arguments sake, what would I have missed if none of these were to hand? It was nice to read that Swansea had some luck through Rangel’s last gasp goal and came away with a much needed point. It’s usually the other way around (well, certainly last season) where Swansea would score the goal and some odd referee would decide to play an unnecessary 5 minutes injury time where the opposition would then score and three points became 1. So, well done Rangel and thank you to the 93rd minute; a minute who rarely delivers. With Pratley’s current contract expiring in the summer, Rodgers has basically issued the sensible ultimatum: re-sign or be sold. While some fans may not want to see the likes of Pratley, Rangel or De Vries leaving Swansea, it’s better for them to go for a good price than for free. I’d hate to see De Vries go, and the same goes for Rangel – both performing well – though Darren Pratley seems to be annoying fans at the moment. He isn’t the rock that he was last season and has crumbed slightly, maybe in the shadow of great performances by Gower and Sinclair. Time for him to go? If he finds his form again, it will be worth keeping him as he is a great player. If he stays as uninspiring as he currently is, Swansea would be better off without him. So onto last night’s game. I didn’t brave the trip to the Liberty, mainly due to travelling home all day, so decided to listen on the radio from the warmth of my house. From the first minute it appeared that I had made a mistake – the Swans were going to hammer Portsmouth 5-0 and I was going to miss it! Suddenly (well around the time Portsmouth had their first goal disallowed), the momentum changed and Swansea began to slowly fall apart. Not even a Brendan Rodgers triple substitution helped as Pompey got behind the ball and shut out the game. All credit to the boys in black (unnecessary third kit), they deserved their three points. So what happened to Swansea? Did they buckle under the pressure of the largest crowd (17,000+) this season? The underlying strain of being in the top three? The expectation of always having to win at home? Or maybe it was just an off day? If it was pressure that got to them, they’ll need to learn to cope as the Premier League will create more pressure than they’ve ever known. If it was an off day, fair enough – everyone’s allowed an off day. But one a season is more than enough. The way things have been going, off days may be more of a regular occurrence. A blip is a good way to describe what happened in tonight’s game. On an icy cold night in the Liberty Stadium (a night that I really should have worn a hat), Swansea began the game as usual. But just 6 minutes in, Bristol snuck a goal and things went downhill from there. A usually solid defence seemed less so than usual, with Tate letting defenders get by him too easily, and Monk and Williams arguing over various defensive positions. At one point in the second half Campbell-Ryce (Bristol) ended up with the ball deep in the Swans half. Williams and Monk both pointed at the attacker but neither moved, until the 14,000 Swans fans in unison screamed “someone get him!”, leaving Rangel to eventually clean up the mess. A poor night for usually the best defence in the league. Defensive issues aside, the midfield was no better. Pratley was rightly subbed at halftime – perhaps missing the Cardiff game made him rusty as opposed to rested, because he looked unsettled and unable to get his first touch right or to keep possession. Agustien looked strong initially, but towards the end of his game was tackled much to easily and sent numerous long balls up field with no accuracy, resulting in, again, a loss of possession. The appearance of Gower and Allen certainly sparked the Swansea attacking game, but still made no real dent in the Bristol defence. So, to the attack. Sinclair was decent, with a couple of good runs creating a few of Swansea’s chances. Emnes didn’t show his quality and took too many bad touches, a poor final game (...for now?) in a Swansea shirt. Dyer, however, was fantastic, showing unequalled pace and great control. Had all the team played like Dyer we would have won, no doubt. Annoyingly, before the game, I bumped into Nathan Dyer in the car park, where I asked him if the Swans would win. He said yes. Now, I feel like my question jinxed it. Sorry everyone – my bad! Positives? Nathan Dyer, but otherwise not that much tonight. But worry not – it is only a blip. Luckily with Cardiff only picking up a point tonight, Swansea’s position in the table has not changed (still 3rd, above Derby and below Cardiff). However, it could have been so much better as a win would have taken us within a point of the Bluebirds. Roll on Sunday, where every player will be looking to redeem themselves against Middlesbrough! Right, I’m off to eat a Cherry Bakewell and defrost in front of my fan heater! 2) 99.9% of you reading this will have watched the match either in the stadium or on the BBC, so you know exactly what happened. While I mention the BBC, can I ask why they felt the need to let Robbie Savage commentate? He sounded like he’d won some sort of competition to ‘have a go at commentating’! Chipping in with Cardiff bias comments and, at times, unnecessary points of view didn’t make the experience any more enjoyable. I’d have preferred silence. As a football commentator myself (I commentate for Swans matches for a hospital radio station), I know it’s not always that easy to come up with something insightful. However, I also know that if I have nothing worth saying, it’s best to just shut up. On Sunday I can safely say I would have done a better job! The match itself, as usual, didn’t fully live up to the hype, mainly because Swansea were the only team actually playing! For a top of the league club, Cardiff looked very mediocre and only half-up for the match. Michael Chopra, usually a decent player, looked amateur and dirty after the series of leg-breaking tackles he committed. Swansea on the other hand did everything as they have been doing over the past few months, which was playing good football. They kept possession and, despite Dave Jones’ opinions, used it to create chances and eventually score the goal that sealed the derby victory. Alan Tate, Nathan Dyer, Ashley Williams and Joe Allen all put in solid performances with the rest of the Swans all above par. Swansea talked up the importance of the derby before hand and put in a performance to match. It’ll be a shame to see Emnes go back after his wonder goal. He has one more game for the Swans, and then he leaves. I’m not too sure of the terms of his loan, but I wouldn’t want him playing against us on Sunday when Middlesbrough travel to the Liberty! Hopefully (at the risk of sounding selfish) things won’t work out for him up North and he’ll rejoin us during one of the next few transfer windows! My final note is regarding the bout of Sunday games. Firstly, there are no Saturday home games until January, which is crazy! Just because Wales are playing a series of test matches (come on, just call them ‘friendlies’...) on Saturdays in November, the usual football schedule is thrown into disarray. I know many people like rugby, and I know many Swans fans will want to watch the rugby as well as the footy, but why does the rugby have to take priority? Football is played week-in week-out and should have first say. People of Wales should be wanting to see the Swans charge towards the Premier League! 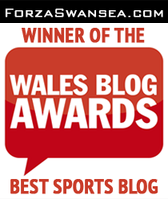 If any WRU members are reading – move the rugby to Sunday! Saturday is for FOOTBALL! So, onto the Bristol City and Middlesbrough games on Wednesday and Sunday (arrgh) respectively where six points will be up for grabs and probably in the bag for the high flying Swans! In the match against Crystal Palace, where Swansea didn't sparkle, yet still managed to walk away with the best away win in almost three years, I feel reassured. What will happen in a game when they don’t just sparkle, but fully explode? Well, a great time for this explosion would be on Sunday – Swansea vs. Cardiff. The derby. Up there with the worlds’ most famous sporting rivalries: Wales vs. England, Italy vs. Brazil, Liverpool vs. Everton and Shenzhen Xiangxue Eisiti vs. Guangzhou Pharmaceutical F.C. (yes, that’s an actual derby, though maybe not as celebrated as the others). The South Wales Derby promises to be a fine spectacle as usual. With many Jacks travelling to Cardiff, the atmosphere should be electric and will create one hell of an arena for the players to battle on. Firstly, let’s hope for a trouble free day (the bubble should sort out most of it, we hope). Now, down to the match itself. It’s worth mentioning the obvious exclusion of Darren Pratley and Jay Bothroyd for Swansea and Cardiff respectively. The question has already been asked: should Pratley have been subbed before he got the yellow card during the Palace match? Why didn’t Rodgers take him off? I believe, in these circumstances, the onus is on the player to avoid putting themselves in the position where they will be penalised. Pratley knew he was on a warning, and with less than ten minutes to go, should have kept off the ref’s radar. The booking is in the past now, but the Cardiff game is yet to come, so who will fill in? Thankfully Kemy Agustien is back training, so he will slot nicely into the Pratley-shaped hole (this may well be a long term solution after more speculation today over Newcastle and Wigan after Pratley, but that’s another story). Agustien combined will Allen and Orlandi, should keep the midfield ticking over nicely. Cardiff will be suffering just as much, if not more, with the loss of their goal machine, Jay Bothroyd after a similar one-match suspension, where he received a yellow card against Norwich on Saturday. Upfront, Swansea have more fire power than last year – Sinclair the obvious target man, but we will have Emnes ready for action (still a Swan until he’s back in Middlesbrough), who we know is goal capable. With Dobbie and Beattie also available, as well as Dyer on his wing, Swansea have many attacking options so goals shouldn’t be a problem (please don’t quote me on this though!). Despite losing Bothroyd, Michael Chopra is back in the Cardiff squad. Chopra is very dangerous when on form, so Ashley Williams and co. will still have a lot to deal with, but it’s nothing they haven’t dealt with efficiently before. I haven’t mentioned Bellamy yet, who will provide a massive challenge to the Swans back four too. However, he is just another test that the Swans defence will relish, especially as its all practice for the Premier League next year. So, some early predictions? If Swansea play like they have in the past weeks, I feel a sneaky 2-1 win could well be on the cards. However, Cardiff are top of the table, performing very well and also have the home advantage, which makes me think a draw is more likely. I’m going to go for 1-1, which, despite the passion to win the derby match, is a result I think most Swans fans would take. My money may be on the draw, but its money I’d rather lose to see Swansea claim the bragging rights! Don't be a Closet Jack! Since my blog traffic stats had to be deleted and reinstalled, I felt the only way to get my traffic tracker whirring again was to announce a new blog post! So here it is! A few things have happened since I last posted. Frank Nouble has returned to West Ham after a not very memorable performance with the Swans, Gorka Pintado is back playing for the reserves (is he really going to feature again in the first team?) and the Swans ended their Carling Cup campaign, after being beaten by Martinez’s Wigan, 2-0 on Tuesday night in front of a massive truckload of travelling supporters. And it’s these travelling supporters I want to talk about. These men (women and children) who braved the endless motorway journey to Wigan, just to see a second string side, returned home very disappointed. I can safely say that half of the 4000+ Swans fans wouldn’t have travelled so far if they knew such a weak team was going to be played. But do these long, away game trips show you are a good supporter? Not really, no. You are not obliged to make that kind of trip. You don’t even have to buy a season ticket. I think that by making the effort to go and watch Swansea at home a good few times a year, checking the scores and reports online when you can’t get to the game and generally keeping up to date with the club is the way to show you are a true fan. So by travelling to these away games it just shows that you are not a good, but a great supporter. I say all this because the Cardiff game is just around the corner and, with it, the true “fans” begin to show themselves again. The ‘Closet Jacks’ as I call them. “Fans” that don’t know Dyer from De Vries, but will watch the Cardiff game in the safety of the pub just to shout derogatory slurs at our neighbours. These “fans” who are unaware that Trundle has left the club are the people who will buy bulk tickets to the Cardiff home game, just to chant ‘scum, scum’ and so on, leaving no tickets for those who watch the Swans most weeks but can’t afford a season ticket! When (and it will happen) Swansea achieve promotion and play their football in the Premier League, these Closet Jacks will show up more and more, but not because they are becoming bigger fans of Swansea, but rather just to see Man Utd down here. To watch the Arsenal, Chelsea, and Liverpool games. This, of course, will only be to see Rooney, Gerrard and Drogba in Swansea. They won’t be there for the game against West Brom, Wolves or other smaller Premier sides. Why bother go to the game unless you can see a star? These people irritate me. I have a friend who is a Closet Jack. In fact, the only time I will receive contact from him is to watch the Cardiff game on TV in the pub. I don’t think he’s been to the Liberty. I don’t think he knows half of the players, what points Swansea are on and the last handful of results. While annoying, these aren’t necessarily bad people. However, when you only watch two games a year on TV (both vs. Cardiff), you are not a true supporter. Being a Swans fan shouldn’t be about hating Cardiff. It should be about loving Swansea! It may be great to see Swansea win against Cardiff, but don’t be the loudest one, shouting ‘you scum bastards’ then forgetting about the Swans until the next Cardiff game. It’s much like the Six Nations (rugby) tournament. Every rugby “fan” in Wales will pull on a battered old Welsh rugby jersey and scream “Wales, Wales, Wales”, “as long as we beat the English” and such, which is all very well, but rugby is played throughout the year, not just at the Six Nations and not just against the English. Where are these Closet fans when Wales play Canada in a Friendly on a rainy Cardiff night? I’m only a relatively new Swans fan (within the last three years – read my bio and you’ll understand), so I am in the position to salute all you who are there week in, week out. Well done to those of you who travelled up to Wigan, and those of you who travel to occasional away games, and those of you who have a season ticket, and those of you who go to most Swansea home games and check the scores online if you can’t – you are true Swans fans, and put Closet Jacks (like my friend) to shame. Will someone please show this video to David Cotterill? Third time lucky? Only joking, but I think your next penalty needs to find the back of the net or it may be time to pass the duty to someone else. Penalties aside, Tuesday evening might have been a cold one in the stands, but on the pitch the heat was high, with 7 yellow cards and quite a few ‘handbag’ moments throughout. It made for fine watching if you were a neutral. However, as a Swans fan it might have been a different story with QPR really dominating in the first half, until the Swans got back on track after the break. Although we were unlucky not to score the penalty, we were very lucky not to concede a few in the first half. In the end both teams walked away with a point, which, against a top of the table side, is a good point to have. Onto Saturday, where Swansea entertain Sven-Goran Eriksson’s Leicester. I think every Swans fan was hoping that Sousa would still be with the Foxes on Saturday so we could have shown him what he walked away from, but it was not to be. So, instead of embarrassing Paulo Sousa, Swansea will have to put in a decent performance for a Leicester side with more hunger for points (they’re on a role, unbeaten for the last three games – a nice change)! Okay, it’s not vital, but the last two games at the Liberty have seen 0 – 0 draws. Combining these with the 1 – 0 victory at Reading sees Swansea scoring only one goal for the last three games. I know we were spoilt for goals at the start of the season, but give us one (or two, or three) to cheer at on Saturday! The last two home games have been his worst for a while. Giving possession away to the opposition thanks to sluggish movement and generally looking out of puff. He will need to show he still has what it takes to make the Swans back four, as there are others pressing for his position. If Nouble wants to go back to London with everyone talking about him like he so wishes, he needs to make sure he gives them something to talk about. Static movement and slow vision won’t get anyone chatting. So, The Liberty welcomes Sven’s men for a nice Saturday kick about, before travelling to Wigan for the long-awaited Carling Cup clash on Tuesday. Forza Swansea! That’s the essentials out of the way. Down to the other facts. Fair enough. From a couple of clips that I’ve seen of him, I would agree he is speedy. And from the below clip that I’ve fished from the dregs of YouTube, you can see him scoring a magnificent solo(ish) goal for Sparta Rotterdam! Some of the Swans fans now un-tilt their heads and say “ah right, I understand”, but a few may still be confused as to why it’s only a month loan period. Rumour has it that Emnes was a signing that Rodgers wanted to make before the start of the season, but for one reason or another it never happened. This is good news as we now see it isn’t just an impulse buy like that overpriced lip balm I bought from Boots the other day. This is just the first opportunity Rodgers has properly had. But surely a month isn’t long enough? Well, if we’re going by calendar months it should be: we have a whopping 8 games in the next 33 days or so, which, providing he plays at least 6 of them, should be enough exposure for the fans and Brendan Rodgers to make the decision. Pursuading Middlesbrough to let him go permenantly shouldn’t be too difficult – he’s only made 31 appearances for them since 2008. But Emnes? I hadn’t heard of him before today. Is he really worth having? Well, I’d never heard of Scott Sinclair until he joined the Swans, and that worked out pretty well! Will this be another Rodgers miracle signing? Hopefully we’ll find out tomorrow. Internationals over, let's have some Swansea! Doesn’t it seem like aaagggeeesss since the Derby match? Despite the obvious advantages of the International break (outlined in last week’s blog), I eagerly await the action from the Premier League, Serie A and, for Swans fans everywhere, Championship action kicking-off again this Saturday! A win would be a great prize to both teams, with the victor (providing Burnley lose or draw against Sheffield Utd) launching into the top 6; a place that was home to the Swans for most of last season. Though both teams are on the same points (16), Reading are a place above them thanks to goal difference. With Sinclair and Pratley hopefully back from injury, there’s no reason why the Swans can’t grab at least one point away from home. The stigma of no away result has vanished, so the only thing players can blame for not getting any points is themselves. So here's to hoping nobody gets blamed because Swansea win! After Reading, we entertain QPR at the Liberty on Tuesday, before (finally) a Saturday home game against Leicester on the 23rd. Interesting fact alert: From now until Christmas, there are only three Saturday home games - Leicester, Portsmouth and Millwall. Interesting fact over. If you read last week’s blog, I found a new team with an obscurely great name in the Highland League. With no international breaks up there, my new favourite team 'Keith’, won 3 – 2 against Formartine Utd last Saturday. Well done Keith. Well done. Saturday was the first time this season that the Swans let anyone walk (or drive) away from the Liberty with a point. 0-0 against Derby and, in all fairness, not a bad game (unlike last year where the 0-0’s were tedious). Swansea were clearly missing Sinclair (as well as Pratley and Cotterill); despite what Monk says in this article, it does seem to be all about one person at the moment. Paulo Sousa has been swiftly removed from Leicester, a removal that was expected by all. Maybe not so soon. Is nine games really enough time to judge a man? I suppose it probably is, considering what he did for them while he was there (nothing). I didn’t really have anything against the guy during his time at Swansea. He took the Swans to their highest league place in 27ish (is that right?) years, which is good going. He seemed to lose his touch at the end, so him buggering off was a blessing in disguise. We wouldn’t have had Rodgers, or Sinclair, if he’d stayed, or entertaining football for that matter. Or goals. Or... I could go on. I can’t really see him getting another job in the Championship or higher, and he probably thinks he is above the lower leagues, so I reckon he will head out of Britain. Good luck Sousa, you old fox! No Championship or Premiership action this weekend. I know a few fans are annoyed about the international breaks, but ultimately they have to happen! Wouldn’t you feel empty come 2012 if there was no European Cup! You can’t wait four years for the World Cup without a Euro in between! Just think – that’s a month of extra football at the end of the 2011/2012 season. Losing a couple of weekends at the Liberty throughout the season is an investment towards more footy in June 2012! Imagine the look on your girlfriend’s / wife’s / mate-who-hates-sport’s face when you tell them that the season is over but there's still three weeks of football left to play! I love that look. If you need some live football this Saturday though, the Scot-Ads Highland Football League fixture of ‘Formartine United v Keith’ kicks off at 3pm Saturday! I never knew there was a team called Keith. That is fantastic. More odd thoughts on the Swans (and maybe ‘Keith’) in a few days! FIFA. A man’s best mate on a long winter night, short winter night, long winter day, short summer evening, long… you get the picture. Perfect game for every occasion. The sworn enemy to wives and girlfriends worldwide. Love it or hate it, FIFA 11 was finally released today! If you are slightly mental / up at that time, you could’ve headed into town to pick up your copy at midnight. Me? I’m a definite enthusiast, but too lazy for a midnight shop. Instead I headed out first thing this morning, grabbed it and went home to fire up the PS3. After playing a few games, I’m ready to share a couple of thoughts. The squads have been updated completely (apart from the loans – Kuqi is in the Swans squad and Nouble is still with West Ham). Real life injuries are overlooked, meaning Pintado, Beattie and Bodde are all fit and available to play. No sign of Makabu-Makalambay, but he was a late signing in all fairness; if he performs well for the Swans in real life, I’ll sign him to my FIFA team! Obviously a lot of money has gone into rendering the big names (Rooney, Kaka, Chiellini) as accurate as possible. Most of the players in the Premier League, Serie A, La Liga, all look and move basically identical to real life. However when we jump to the Swans squad, up-close the players look bugger all like their real life counterparts. From a distance though you can easily tell who’s who. Even though the facial detail isn’t accurate, the smaller details seem to have been picked up and included: Scott Sinclair’s yellow boots and strapped wrists, Dyer and his bright red boots (does he actually wear these anymore?) and the bullish running that is (was?) Kuqi. The body types have had, like advertised, a complete revamp. You wouldn’t confuse Williams with Dyer if they stood next to each other in real life and this has been mimicked in the game. Game play is immaculate, with EA totally revamping passing style and control. As I’ve said, this isn’t a full review as I haven’t had time to play until my fingers bleed (yet), but I’ve already noticed subtle changes, such as controlling the ball and the way the ball bounces off the keepers – much more realistic this time around. Passes won’t always go to who you want; it all depends on the power and angle you hit the ball – which makes the game less ‘ping-pongy’ and therefore harder to score (well, that’s my excuse anyway)! Other features within the game have been created. For example, before playing an exhibition match, you’re able to select which referee you want. They differ in the strictness over cards and fouls, which can totally change a game (as you know if you’ve seen some of the refs down the Liberty over the last year). During the game, stats appear at the top of the screen: passing, possession, shots which make for a more realistic experience. At the end of the game, you can select different highlights to watch – the computer will pick up any good shots, saves or misses and files them for your convenience. If you missed a sitter during the match, it will be waiting for you at the end! Another feature I’m yet to try is the option to set your own personalised themes for when your team walks out onto the pitch and scores a goal. I just need to find an MP3 of the souped-up theme from Gladiator and that’ll be the Swans entrance sorted! So there we go. A little summary of what I’ve experienced so far. To be honest, I’ve barely scratched the surface, but am sure I will over the next few months. Look out for a more in-depth review later in the year. If I can still type through the blood.